Orcs are a race of proud warriors, battle-hardened soldiers, and fierce bandits. Originally created by the eastern shapers to serve as a sort of military and police force, the orcs have developed a strong warrior culture based around honor and service. When the shapers left, the orcs tried to form a kingdom in the east, but knew nothing of the actual arts of leadership. Eventually, angry and embittered, the orc nation disbanded. Now, the orcish warriors travel in warbands from atop the backs of dinosaurs, raiding villages and taking what they need. Personality: Orc’s lives are dominated by honor. An orc who swears an oath will lay down his life to keep his word, and dishonored orcs are known to go to incredible lengths to regain their honor. Orcs can be fierce enemies or stalwart allies, with very little middle ground. Orcs have a tendancy to be rigid in the face of any challenge, even when it would likely be wiser to compromise. Orcs enjoy combat, and will often challenge fellow warriors to competitions when there is no battle to be found. These matches come in many forms. Some prefer competitions of accuracy, favoring the bow. Others ferer the art of the sword, and challenge each other in mock duels. Still others abandon weapons altogether for tests of raw strength. 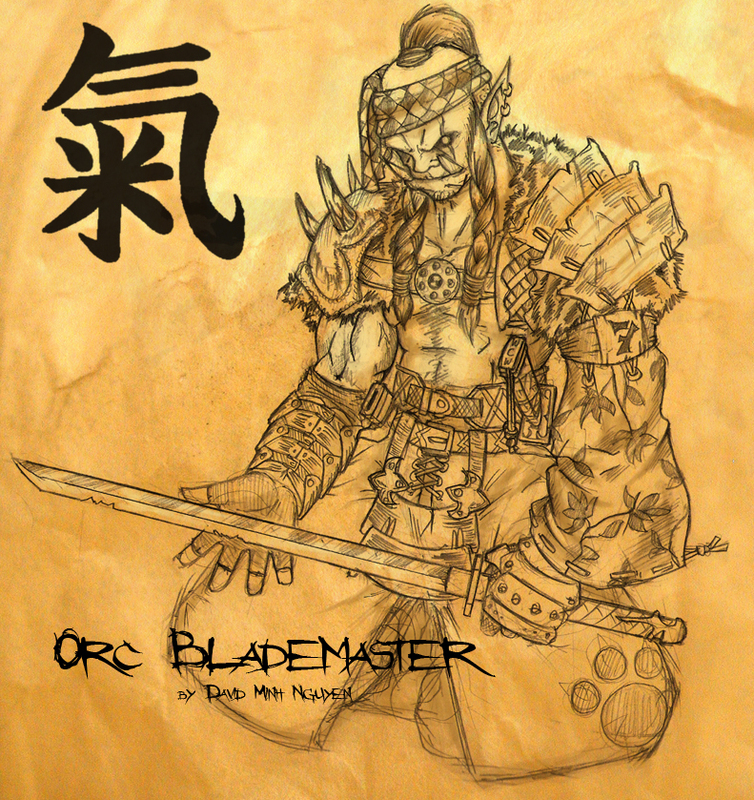 Physical Description: Orcs generally have black hair, with skin ranging from a pale yellow-green to dark gray. Males and females both stand about six feet tall, with broad shoulders and wide chests, weighting somewhere between 180 and 210 pounds. Orcs have four short tusks that just from their strong lower jaws, and reddish eyes. Both orc males and females keep their hair as long as possible, usually tying it back in a ponytail or bun. In a battle between orcs, the winner cuts the loser's hair, claiming the tail or bun as a trophy. The losers of a battle will ritually cut their own hair short and are considered shamed until it grows back to the proper length. Humble orcs, such as monks or priests, will often shave their heads as a sign of abandoning their pride. Orcs out of combat generally wear lightweight, practical clothes. However, orcs do enjoy the finer things, and if given a chance to attend a formal ball or social function, orcs will invariably choose the most colorful and shiny outfit available. Relations: Orcs view dwarves as cowards who hide in their mountains and behind their metallic servants, refusing to show real courage. Elves on the other hand are barbarians, honorless warriors who strike from hiding, too cowardly to show their faces and fight honestly. They get along with goliaths on a personal level, but most orcs still resent the goliaths for stealing the leadership positions they believe to be rightfully theirs. Orcs adore halfling music, a talent that rarely manifests in orcish tribes. Humans get along relatively well with orcs. Beyond these, most orcs prefer to judge by the individual’s action and strength. Alignment: Orcs have a strong lawful bent, but show little preference for good or evil. Most are satisfied to simply follow orders and the demands of their honor. Orcs have a tendency to adapt to the point of view of their leaders. A tribe under an evil warlord will slowly become evil. A tribe under a good warlord will become good. Orc Lands: Orcs don’t have a proper nation of their own. They travel in warbands across the eastern plains on their saurian mounts, setting up camp for a few days or weeks at a time before moving on again. Orc camps usually consist of several dozen tents, carried from one site to another on the back of larger dinosaurs while the orcs themselves ride on smaller, swifter predators. Language: Orcs speak orcish, a harsh, guttural language. The orc tongue is renowned for it’s plurality of terms for tactical maneuvers and strikes, and many warriors learn the language while going through training. Names: Orcish names consist of personal names, clan names, and school names. An orc is given the first two at birth. His clan name is shared among several dozen families, and can change when the clan’s leaders change. The school name is earned upon his graduation from training as a warrior, and is based upon his chosen style of combat. Adventurers: Orcish adventurers are very common. Most orcs are usually warriors, but a strong portion of them take levels in martial classes. +4 Strength, -2 Wisdom, -2 Charisma. Orcs are very strong, but they lack social skills and can often be somewhat oblivious. Darkvision: Orcs can see in the dark up to 60 feet. Darkvision is black and white only, but it is otherwise like normal sight, and orcs can function just fine with no light at all. +2 racial bonus on saving throws against poison: Orcs are hardy and resistant to toxins. Martial Aptitude: Select one of the following martial disciplines: Iron Heart, Stone Dragon, or Tiger Claw. You may always learn maneuvers from that discipline, you are proficient with the weapons associated with that discipline, you gain a +2 bonus to the key skill of your chosen discipline, and you know one 1st level maneuver from that discipline as for which you meet the prerequisites. If you do not have martial adept levels, you can use this maneuver once per encounter with an initiator level equal to half your character level. If you have, or later gain, levels in a martial adept class, this maneuver becomes one of your maneuvers known. Rapid Recovery: Orcs recover hit points, ability damage, and ability drain at twice the normal rate when resting. Automatic Languages: Common, Orc. Bonus Languages: Dwarven, Goblin, Gol-Kaa, Undercommon. Favored Class: Warblade. A multiclass orc’s warblade class does not count when determining whether he takes an experience point penalty for Multicasting. I wanted to give the orcs a little dignity. Make them more than 'generic savage humanoid race +1'. When I found the picture up top, I was still just thinking in terms of proud warriors. The picture just crystallized all those floating ideas into this combination of native american/samurai/viking. Also, I wanted them to actually have an advantage in combat apart from their great strength, so I made them heal fast and handed them some weapon proficiencies. There really wasn't anything to work WITH when it came to orcs, so most everything had to be done from scratch.